We have a long-term commitment to improving the area for workers, visitors and residents. 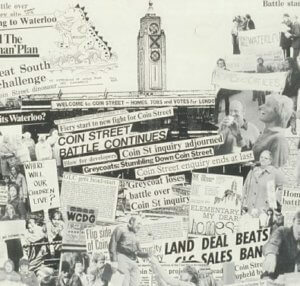 Coin Street Community Builders, the BFI, National Theatre, Shell and Southbank Centre came together to form South Bank Employers' Group to work together to improve their neighbourhood over 25 years ago. From improving the east-west Spine Route and support for the Golden Jubilee footbridges at the turn of the century to leading the rebirth of the Jubilee Gardens this decade, the South Bank has been transformed. Now with 19 members - our unique organisation pools our members' resources and energies to keep South Bank thriving. We strive to ensure South Bank is welcoming, safe and attractive for its 30 million visits a year by providing high-quality destination marketing and delivering crucial security, neighbourhood management and public realm projects. 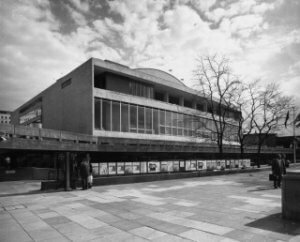 SBEG is formed by its first members: Coin Street Community Builders, ITV, BFI, National Theatre, Southbank Centre and Shell UK. South Bank Marketing Group (then South Bank Image Group) is formed. This is a sub-group of SBEG that becomes the official destination marketing organisation for the area. 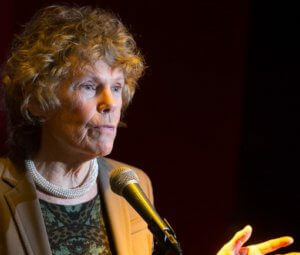 The South Bank Partnership and the South Bank Forum are created, increasing both the transparency of the organisation and strengthening ties with every level of local and national governance. Work begins on the Spine Route project, one of SBEG's first capital schemes. SBEG and Lifschutz Davidson architects design South Bank banners, after a series of competition entries for the design. 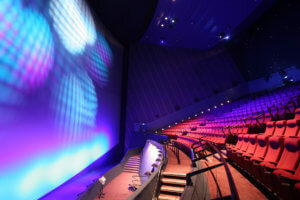 The BFI IMAX is constructed. 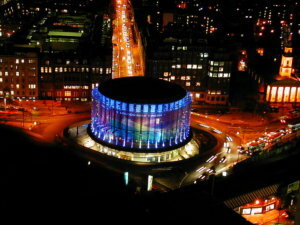 It stands at the centre of Waterloo roundabout and is the largest cinema screen in the UK. 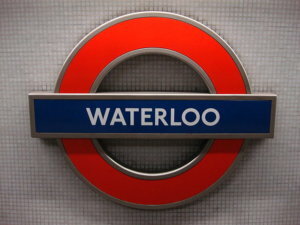 The Jubilee Line extension opens, serving Waterloo Station for the first time and making the area even more connected with the rest of central London. 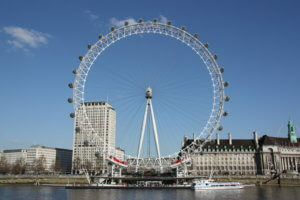 The London Eye begins turning for the first time. Its opening launch on NYE 2000 is met with international acclaim. 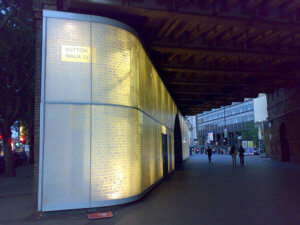 The Sutton Walk Glass Wall and Monolith is delivered by South Bank Employers' Group as a public art project. 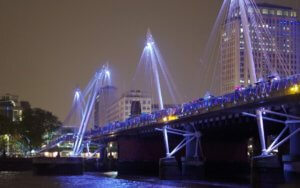 The Golden Jubilee Bridges are officially opened. Millions of extra visitors each year are now able to come to South Bank for work and play; the bridges become a key thoroughfare to and from the north side of the river. 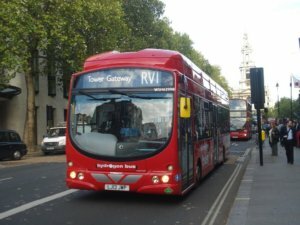 We launched the RV1 Bus, better linking South Bank, Bankside and London Bridge with Covent Garden. 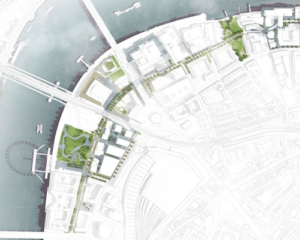 Coin Street Community Builders commissions Lifschutz Davidson Sandilands architects to create an urban design strategy, aimed at drawing in new investment, creating better infrastructure and a significantly improved environment for workers, visitors and residents. 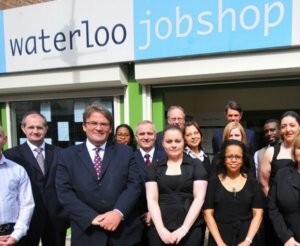 Our Employment and Skills team works with over 70 local employers to deliver an employer-led recruitment programme through the Waterloo Job Shop. We complete our work on the Riverside Walkway. 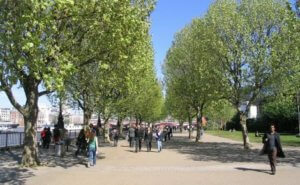 People from all over the world enjoy this newly renovated walkway as a famed location in which to stroll along the Thames, taking in the unparalleled London skyline. .
SBEG welcomes London South Bank University and Network Rail to the group this year. 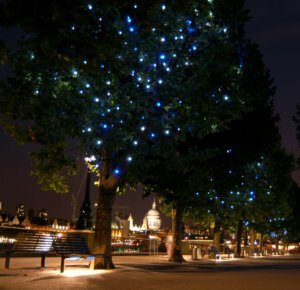 We completely refurbish the historical 'sturgeon' lamps and install an impressive tree lighting scheme. 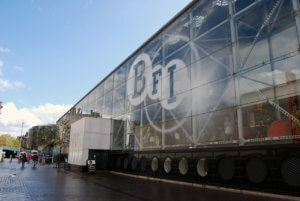 The National Film Theatre reopens as BFI Southbank. 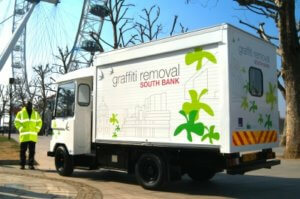 SBEG launches a graffiti removal service to the businesses in South Bank, aimed at improving public spaces and the local environment. 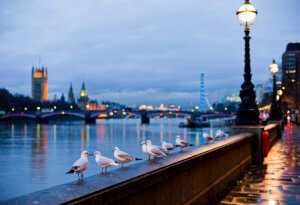 South Bank Marketing Group is officially recognised by Visit London with a Gold Award at their annual awards ceremony. We deliver the renovation of Waterloo Road's lighting scheme. 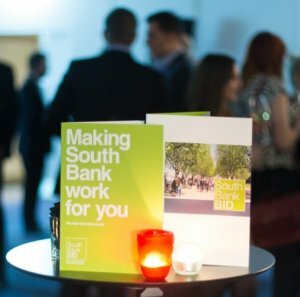 South Bank Business Watch launches, a collective of commercial, cultural and public sector organisations focusing on security issues affecting South Bank. South Bank Patrol starts operations. We fund and deliver this service to deter crime and reduce anti-social behaviour and unlicensed street trading. It also engages with private security teams, the Metropolitan Police and others focused on improving security. 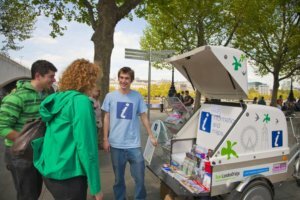 The InfoBikes begin their award-winning service to the millions of annual visitors to South Bank, providing a mobile visitor information service including wayfinding and recommendations for what to do in the area. 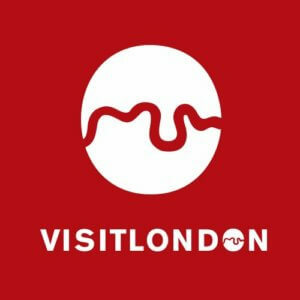 The InfoBikes go on to win the Visit London Award for Best Visitor Information Initiative. 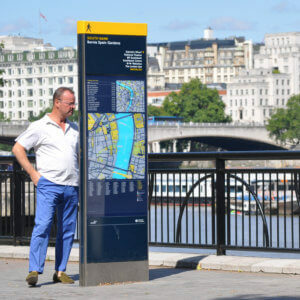 Legible London is an easy-to-use signage system that presents information in a range of ways, including maps and directional information, to help people find their way. 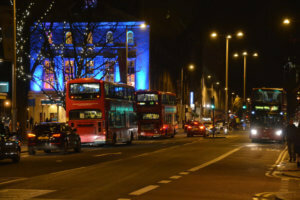 The Clean Team perform a huge amount of services to South Bank, including polishing street furniture, weeding and clearing landscaped borders, putting up posters and maintaining signage. We deliver a two-phase scheme called King's College Plaza with Lambeth Council to turn the space into a pleasant meeting area for students, residents and visitors. 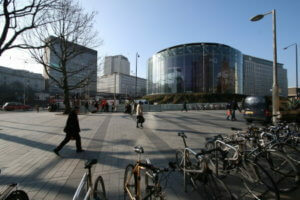 The development features energy-efficient lights, new paving, benches, bike racks, recycling and litter bins. 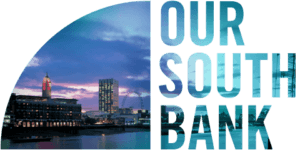 South Bank Venues is conceived and launched to promote South Bank as one of London's top destination for business tourism and the MICE segment. 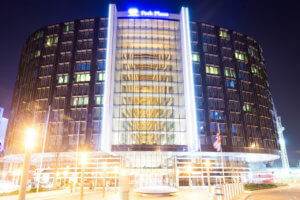 The £350 million, 15-storey Park Plaza Westminster Bridge starts welcoming guests. 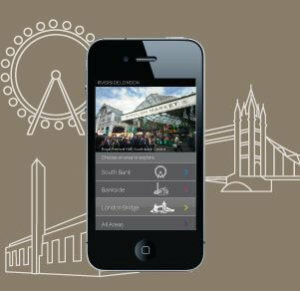 We launch the Riverside London App, in collaboration with Better Bankside and Team London Bridge. 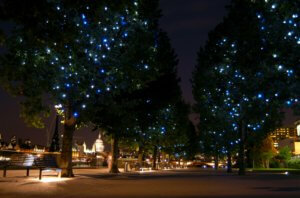 The app is a What's On guide for events, offers, shopping, eating and drinking along London's Riverside. South Bank Patrol wins the National Security Excellence award in recognition of their exemplary service to our neighbourhood, protecting the area and reducing petty crime. 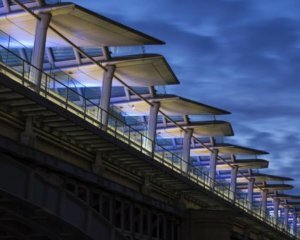 Blackfriars Station reopens, featuring 4,400 solar panels and entrances on both sides of the Thames. South Bank Patrol is awarded the Home Office ‘Tilley Gold Merit Award’ for partnership working, particularly for its use of Delegated Police Powers. 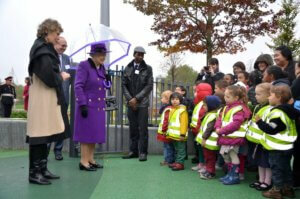 HM The Queen officially opens Jubilee Gardens after a £3.5m restoration that SBEG led. 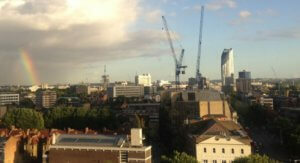 Construction works begins on One Blackfriars, a residential development. South Bank Visitor Management Group launches a new website oursouthbank.com which contains up to date information regarding new constructions, capital projects, traffic delays and more in South Bank and Waterloo. We launch the South Bank Business Improvement District in order to raise more funding for area improvement and management and broaden our business engagement. 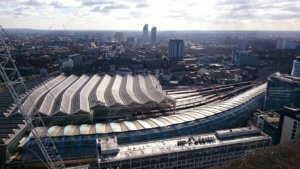 SBEG facilitates the production of the South Bank & Waterloo Neighbourhood Plan. The plan is led by South Bank & Waterloo Neighbours, a group of over 500 local residents, workers and community groups. The plan will hold statutory weight in planning decisions for the area. 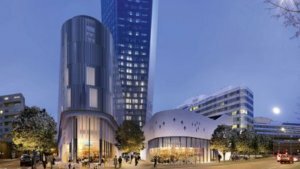 Southbank Place is a joint project by the Canary Wharf Group Plc and Qatari Diar, two major real estate development companies. 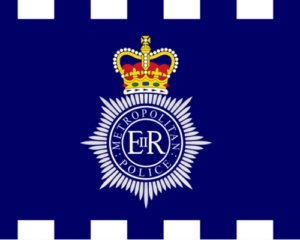 The Met Patrol Plus scheme provides additional police resources to South Bank to tackle security issues important to local businesses, employees, residents and visitors, including unlicensed street trading, aggressive begging, unlawful gambling, street drinking and theft. 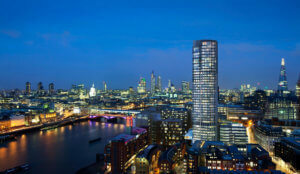 South Bank Tower is officially opened and its first tenant (and South Bank BID member) Waitrose begins trading. 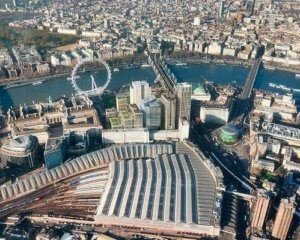 Waterloo station hits 100 million annual passengers, making it the busiest station in the UK and one of the ten busiest stations in Europe. 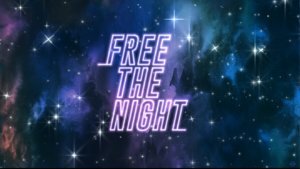 The Night Tube has huge significance for South Bank, as it marks the transition of the area from a daytime economy to a 24-hour one. 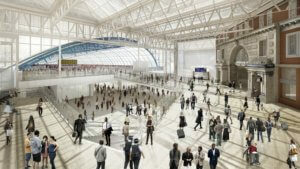 Work commences for the new Waterloo International Terminal. 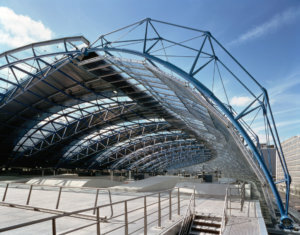 The project is part of a three-year £800m investment at the terminus, which is the busiest station in the UK with 234 million passengers each year. 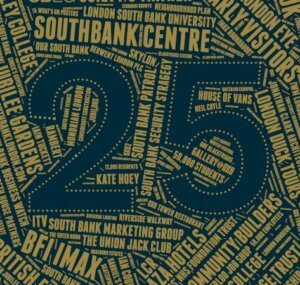 2016 was the 25th anniversary of the formation of our organisation. 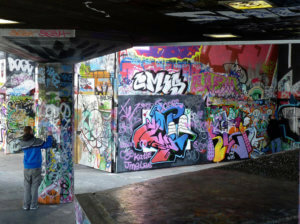 We are looking forward to ensuring South Bank maintains its reputation as a dynamic, vibrant and safe area. We will also strive to manage the pressures it faces from rising numbers of visitors, new developments and other aspects that come with a successful visitor and business economy.